Writable CDs for an easy and quality solution to storage problems. Can be used in CD-R and CD-RW drives without any problem. Provides easy storage of data. Includes slim jewel cases for added protection. 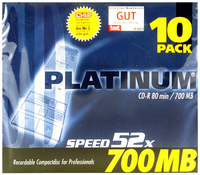 Capacity: 700MB/80 Minutes. Writing Speed: 52x Approx Dimensions (CM): D14.5 W12.7 H5.4. Approx Weight (KG):0.5571.